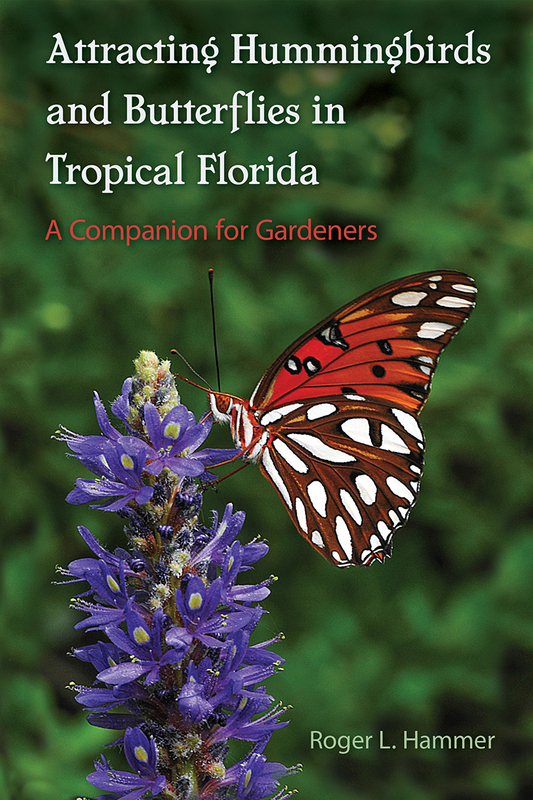 In this authoritative and friendly guide, Roger Hammer shares more than thirty years’ experience tempting butterflies and hummingbirds into tropical Florida’s gardens. Hammer catalogues 200 of the best plants for luring these wondrous creatures into even the smallest of yards and offers helpful tips for beginners and veteran gardeners alike! An added bonus- all of the selected exotic plants are safe for use in Florida. No other resource features so wide a range of host, feeding, and shelter plants for this unique region. When did you know that you wanted to write this book? What led you to this subject/area of research? I have taught classes on hummingbird and butterfly gardening for more than twenty years and have been gardening with plants that attract hummingbirds and butterflies for more than thirty years. I soon realized that books on the subject for Florida just glance over the profusion of tropical plants that gardeners can grow in USDA Zones 10 & 11, or what is referred to as ‘tropical Florida.’ This book will fill a huge gap. How is gardening for butterflies in tropical Florida unique from other areas of the state? There is a bounty of hummingbird- and butterfly-attracting tropical plants from around the world that cannot be successfully grown north of USDA Zone 10 without winter protection. Even many Florida native plants of tropical origin do not range north of USDA Zone 10A and some do not occur north of Zone 10B. This makes gardening in tropical Florida unique to the entire United States. Why do you think that certain native Florida plants are not generally cultivated by gardeners? Should that change? Why? There are quite a number of Florida native plants that are superb at attracting butterflies yet they are not cultivated in commercial nurseries. This is partly due to lack of knowledge, demand, or that some of these species may be too unattractive for your average gardener. Butterfly enthusiasts, however, are a different breed of gardener, and this gives nurseries the chance to cater to an entirely new group of customers. Do plants that attract hummingbirds also attract other wildlife during the summer when hummingbirds aren’t present in tropical Florida? Not all plants that attract hummingbirds also attract other birds or butterflies, and there are certain flowers that are visited solely by hummingbirds. However, a typical hummingbird garden will also offer nectar sources for butterflies, orioles, warblers, vireos, and a host of nectar seeking insects, including moths. Do you have your own garden at home which you tend to? Do you have a favorite butterfly that you hope to attract? My wife and I tend a 1.2-acre of native and exotic flowering trees, shrubs, vines, wildflowers, tropical fruits, and palms. Our yard list of birds exceeds 120 species and we have documented more than 50 species of butterflies in our garden. Some of the more unusual butterflies that oftentimes grace ourgarden include dina sulphurs, pink-spot sulphurs, amethyst hairstreaks, polydamas swallowtails, malachites, dingy purplewings, and the Florida atalas. These are in addition to the more familiar giant swallowtails, orange-barred sulphurs, monarchs, queens, zebra longwings, and skippers. Malachites have not been seen in our garden in about five years now so we hope they reappear someday. How has being a wildflower photographer influenced your perspective on botanical life? Being an avid wildflower photographer has given me a reason to explore wilderness areas in Florida that I otherwise may never have visited, and this journey has taken me from the Lower Florida Keys to the far western reaches of the Florida Panhandle. A byproduct of wildflower photography is meeting other people with shared interests. Do you have one piece of advice for new gardeners seeking fertile and active gardens? My best advice to new gardeners is to never let failures become reasons for discouragement. Accept failures as experience and move on because gardens are places of constant change, just as it is in nature. Do you have any tips for how children can lend a helping hand in the garden? Gardens are outdoor classrooms and nothing is more exciting to a young child than to play in the dirt outdoors. Having a child marvel at a flower, a visiting butterfly, or a hummingbird darting from one blossom to another is something the will carry with them as they become adults and have children of their own. I truly hope readers will enjoy learning about some new plants to add to their gardens and give them pleasure for years to come. What would you consider the single best plant for tropical Florida gardeners to grow to attract hummingbirds and butterflies? I do not hesitate to say, Florida firebush. Roger L. Hammer is a professional naturalist and has an honorary Doctor of Science degree from Florida International University. He is the author of several books including Everglades Wildflowers and Florida Keys Wildflowers.